St. Mary’s University this week was awarded more than $5.3 million to boost the growth of its School of Science, Engineering and Technology. The University received a grant from the U.S. Department of Education through the Hispanic-Serving Institutions (HSI) STEM Program. The University will use the funding for STEM (Science, Technology, Engineering and Math) education development. David Turner, Ph.D., Associate Professor of Environmental Science, and SET Dean Winston Erevelles, Ph.D., led the group that developed the grant proposal. The grant will be under Turner’s direction. St. Mary’s has seen significant enrollment gains in undergraduate STEM programs since 2010, especially among Hispanic students. This fall, more than 47 percent of St. Mary’s freshmen chose a major in the School of Science, Engineering and Technology. At the same time, San Antonio has been on a mission to develop industry in these fields. St. Mary’s is advancing its STEM pipeline in order to connect students with growing professional opportunities. 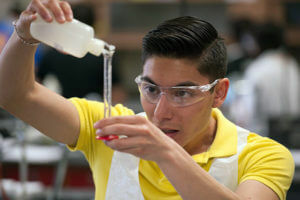 By the end of the project, St. Mary’s expects to increase enrollment in STEM programs by at least 6 percent, with at least 50 percent of new students being Hispanic and/or low income. The University also expects to double the number of transfer STEM students. As a result, St. Mary’s anticipates increased graduation numbers in these fields. At least 8 percent more undergrad STEM degrees will be awarded overall, and at least 9 percent more will be awarded to Hispanic students.